Sundare sundaro ramah …… Sundare sundari katha………. Sundare sundaram mantram…….Sundare kim na sundaram……. The fifth kaandam in Sriramayanam known as “SUNDARA KAANDAM” is the most popular kaanda. Unlike names of other kandams which are self explanatory, this kandam is known as “Sundaram-beautiful” as everything ..
–Hanumanji’s Rama bhakti, Sitadevi’s chastity, Srirama’s plight to rescue HER, their concern for each other, torments in samsaara are so beautifully described by maharishi. The characters of the trio makes even a stone melt. That’s the reason even after so many lakhs of years, we read Sundarkandam with reverence. Also, reciting Sundarakandam is considered equivalent to reading the entire Ramayana as Hanuman and Trijata narrate all the incidents-past,present and future in the august presence of Sitadevi. After coronation of Sugreeva as the King of Vaanaras, Lord Srirama and Lakshmana spent four months during monsoon in Malyavan parvath in Prasvanagiri in Hampi, Karnataka. Lord Srirama experienced unbearable pain due to separation from our mother Sitadevi. The Lord was worried about Sitadevi’s welfare and used to lament uncontrollably. At the end of monsoon, Sugreeva deputed crores of vaanaras and bears in all directions in search of Sitadevi giving them one month’s time to trace the whereabouts and inform for taking up next course of action. Sugreeva explained geographical particulars about all the places around the world in detail . The vanaras headed by Prince Angadha and supported by senior Jambavan and Hanuman were assigned the task of searching in the southern direction. Lord Srirama handed over HIS finger ring to Hanumanji who was standing in a corner. Our poorvacharyars give reason as to why Srirama selected Hanuman to give his finger ring . It was the time at Kishkinda when Lord Rama was in search of Mother Sita . Hanumanji was in thoughts to see Srirama lamenting for a lady. Hanumanji a brahmachari was wondering as to why a person of high stature like Lord Srirama tutored by rishis like Sage Vasishta, Vishwamitra was so emotional . Lord Srirama our antaryami sensed Hanumanji’s feelings . To make Hanuman realise the greatness of Sitadevi, Srirama selected Hanuman and handed over HIS finger ring with HIS holy name engraved on it. And it was also an indication that Paramatma laments for all the jivaatma in the same lines . It was because of the holy ring that Hanuman could cross the ocean and meet Mother Sitadevi and obtain HER blessings. When Hanumanji saw Sitadevi’s steadfast devotion towards Lord Srirama, he regretted for his thoughts initially . Having understood HER greatness , Hanuman visualised both of them together in his heart and offered prayers. Hanumanji introduced to mother Sitadevi that he was “Rama dhoothan” whereas when he returned to Lord Rama as “Sitadevi’s messenger” to convey the good news about Sitadevi’s welfare, he addressed himself as “Raama daasan”. With Mother’s grace, our ego vanishes. Our poorvacharyars comment that when Hanuman went as “rama dhootan”-, he was gifted with fire on the tail whereas when he returned as Sita dhootan, he was embraced by Lord Rama. The vanaras who went in the southern direction explored all the places until they reached SWayamprabha caves in Kadayanallur near Tirunelveli in Tamilnadu . Swayamprabha an advanced Sathwi was the guardian for the magical cave owned by Mayasuran. Anyone who entered could not come out. She hosted the vanaras and later transported the vanaras to the seashore( about 150 kms away from Kadayanallur) after knowing about their devotion to Lord Rama with her powers . Having reached the seashore, the vanaras were worried because the stipulated time of one month fixed by their King Sugreeva was over and they could not trace Sitadevi. They knew for sure that Sugreeva would not spare them and decided to end their lives as they did not have the courage to face Srirama who was already suffering pangs of separation. Angadha had lit a big pyre for them to sacrifice their lives. He started lamenting about Sitadevi’s abduction, Jatayu sacrificing his life in Ramaseva after fighting with Ravana , their search expedition and failure in the assignment. Sampaati-the eagle bird summoned Angadha and introduced himself as Jatayu’s elder brother , shared how he lost his wings while protecting Jatayu from the scorching heat of sun in the process loosing his wings and became immobile. Sampaati was informed about Jatayu’s Raama kainkaryam and he too resolved to do the same. He informed the vanaras about Sitadevi’s whereabouts with his sharp vision in the far away land, Lanka. Having done this Raama kainkaryam, Sampaati regained his lost wings and flew away. Now that the whereabouts of Sitadevi were known, the vanaras started contemplating as to who would cross the ocean which was measuring 100 yojanas (1000 miles) to meet mother Sitadevi. Each vanara expressed their ability to cross few yojanas . Angadha said that he could cross 100 yojanas but would not have the energy to return. The aged Jambavaan who knew Hanuman’s capabilities approached Hanuman and started enumerating his strength and skills. When Hanuman was a child, he mistook Sun to be an apple and leapt in the sky to hold it. He was hit by Indra with vajrayudham on his chin(hanu) and hence was called Hanuman. Vayu, hanuman’s father stopped air which made the whole world breathless. To appease his anger, brahma and other devas bestowed many boons on Hanuman. He confidently proclaimed that he would finish the yeomen task of locating mother Sitadevi saying that like Sri Rama’s arrow which never failed to hit its target, he would accomplish the task. All the vanaras vowed to observe fast until Sitadevi was found. Reposing confidence to the vaanaras, Hanuman stood on Mahendragiri parvatham in Thirukurungudi beyond Tirunelveli in Tamilnadu and after offering prayers to Suryan, Indran, Vayu, Sri Rama , He increased in size and leapt on the sky to cross the ocean. Thus starts Sundarakandam,-the most beautiful kaandam as everything is beautiful in it. Every household in India has a copy of Sundarakanda . It is a normal practice in Srivaishnava wedding to present Sundarakandam to the groom as it is considered very auspicious. Hanuman is the acharya(gurudeva) who extols Paramatma’s qualities to Jivatma, gives the holy name to Jivatma, submits Jivatma’s plea to Paramatma, destroys Lanka(samsaara) with the fire of knowledge and finaly reunites Jivatma with Paramatma. And our journey to Sri Lanka to have the darshan of all the holy places fructified in August 2018 and an attempt is being made to reproduce the divine bliss to millions of Hari bhaktha . Hanumanji must have entered Srilanka from the north-western part via Thiruketeeswaram near Mannar, proceeded southwards and landed on Ramboda hills. The places related to Sundarakandam are mostly located in Central Srilanka upto Sigiriya in the north and Ussangoda in the south. Valmiki maharishi beautifully describes Hanuman’s flight. Hanumanji increased in size and stretching his hands wide leapt from Mahendragiri mountain causing its residents to leave the place. The flowers from the trees had covered Hanuman who was now resembling a flowered mountain. Hanumanji faced the first hurdle which was a friendly gesture by Mynaaka parvatham who was a close friend of Vayu bhagavan ( Hanumanji’s father ). He offered fruits and asked Hanuman to take rest but he refused politely by embracing the mountain for its gesture saying that he intended to reach Lanka by evening and was lacking time. Hanuman won Mynaakam with his friendly gesture. He didn’t succumb to any temptation. The second hurdle came in the form of Surasa who was a Naagamaatha( mother of snakes). The devas prompted her to test Hanuman’s capabilities. Surasa obstructed Hanuman’s way saying that she wanted to swallow Hanuman to satiate her hunger. Hanuman informed her about his mission promising her to return and satiate her hunger but she didn’t budge saying that as per Brahma’s words, none could pass by her without fulfilling her wish. He asked her to open her mouth wide enough for him to get into , started increasing in size. Surasa also widened her mouth to match his size. The witty Hanuman suddenly decreased in size , went inside her mouth and came back even before she closed her mouth, offered obeisances to her and having satisfied her wish continued his journey. As she was a well wisher , Hanuman won her with his intelligence and presence of mind and didn’t kill her. Surasa was pleased with Hanuman .She blessed him assuming her true form. The place where this incident took place is known as Nagadweepa, also known as Nayanateevu, is an island near the North-western part of Srilanka (between Mannar and Jaffna) is now identified as the place where this incident took place. There is a big temple for Naagamaatha known as Nagapooshani temple. This is also considered as one of the eighteen shakti peetams. To reach this place, one has to drive from Jaffna for about 38 kms upto Pungudutheevu . From Pungudutheevu drive for about 15 kms on a bridge to reach jetty. Regular boat services at an interval of one hour is available to go to Nagadeepa. The fare for the boat ride is LKR 50/- and will take about 20 minutes . It is one way-the boat stops near the buddhist monastery and the return would be pick up from Nagapooshani temple or vice-versa . Autos ply between these two places for a nominal charge of Rs.10/- LKR. In Nagadeepa, there are two places to be visited- the first one is the Buddhist monastery as Buddha had visited this place and changed the factionist Naagas into pious people and made them follow Buddhism. Nagapooshani amman temple can be reached by auto. Devotees perform milk abhishekam to the naagas in the temple. The third hurdle for Hanumanjee was a rakshasi named Simhika. Lying on the ocean she had the power to pull the shadow of anyone flying over her. She used her strength to reduce Hanuman’jis speed by pulling his shadow. Hanumanji realised the gravity and the unexpected hurdle . She opened her mouth widely and with all her might, she tried to swallow Hanuman who entered into her mouth and came out swiftly piercing her stomach thus killing her. Simhika was in a pool of blood. Hanumanjee thus encountered the third hurdle who was an enemy in reality with his strength. This place is identified as Thiruketeeswaram near Mannar on the North-western part of Srilanka (between Jaffna and Anuradhapura) about 116 kms north-west of Anuradhapura-a famous site for Buddhists. Also, Kethu-one of the navagrahas who is Simhika’s son prayed to Shiva at this place. Hence this place is known as Thiruketeeswaram. Mandodari’s father built this temple. Presently the Shiva temple is undergoing renovation. Hanumanji landed on Suvela parvatham in Srilanka . This place is now known as Ramboda. Chinmaya mission have constructed a beautiful temple for 16 ft Hanumanjee . There are 3 sets of deities of Sita-Rama Lakshmana in the temple premises. It was well guarded on all sides by armed soldiers right from the foot of the hill. The beautiful city was built by Mayasuran-architect for asuras and Ravana’s father in law. Valmiki rishi has aptly described this location which can be found even today. There were tunnels connections various mountains to which only Ravana had access. Also, there were aircraft centres at various places which was used by Ravana to fly on his pushpaka vimanam. Hanumanjee was encountered by Lankini- a rakshasi who was a personification of Lanka when he was trying to enter into Lankapura. Hanuman politely told her that he would return after viewing the beautiful city but the raksasi didn’t accede. Though she hurt Hanuman by hitting with a mace, hanuman pitied her and slightly hit her with his left fist which was unbearable for her. She accepted defeat and recollecting Brahma’s words that when she would be defeated by a vanara, Lanka’s destruction would be inevitable, she blessed Hanuman to be victorious in his mission. Lankapura is considered as the places around Sigiriya and Kandy. Hanuman defeated Lankini and started searching for Sitadevi in all the places including the Pushpaka vimanam, palaces of RAvana’s queens, Ravana’s palace, Mandodari’s palace, kitchen ,etc. Lankapura was situated on Trikuta parvatham(Sigiriya rock ) making it inaccessible to intruders. He came across stationed armies well equipped guarding the kingdom. The place where Pushpaka vimanam was kept is now known as Gurulopotha near Sita Kotuwa about 100 kms north east of Kandy. (There is only a name board and a buddhist temple ). Likewise Mandodari palace is now known as “Sita Kotuwa” as Sitadevi was first kept here. This is an archeological site about 3 hours drive from Kandy. A guide from the archeological survey office accompanies the visitors to the place. (Guest house facility and a small restaurant serving cool drinks,water, snacks is run by them.) We need to walk down the steep terrain for about an hour to reach Sita Kotuwa. The place where the army was stationed is known as Weragantota. Gurulopotha and Weragantota are situated near Sita Kotuwa. He found heaps of food in the kitchen but didn’t have the slightest temptation to eat. He searched every nook and corner of Lanka but could not trace mother Sitadevi. Hanuman was worried that he had to look many ladies which was against his brahmachari vow. But he convinced himself that if you have to search for a deer, you will have to search amongst deers. Likewise, a woman has to be searched amongst women. AS he respected all women as his mother and sister, his mind was very clear and was only focused on our Mother’s ( Thayar’s ) welfare. After searching for the second time, Hanumanji was worried .He sat on a rock and decided to end his life as he knew that if he returned without seeing Sitadevi, he would be the cause for destruction of Ishvaku race and the vaanaras. Hanuman however regained his determination and realized his mistake. He immediately prayed to Sitadevi guarded by Rama and Lakshmana to disclose her whereabouts similar to the way SHE chose to appear to King Janaka. By the grace of Sitadevi, Hanumanji spotted Ashoka vanam- a beautiful garden which he had missed to explore. This place where Hanuman sat and contemplated on Mother Sita is identified as MANIKATUTHER located between Ramboda and Nuwara Eliya. It is about 20 kms from RAmboda hill and Nuwara Eliya is about 50 kms from Manikatuther. Manikatuther is located in Labbookelle Tea Estate in Kondakalai village on a hill bgetween Nuwara Eliya and Ramboda. WE need to take an auto to go up the hill which has a muddy path from the base. AFter reaching a certain point, we have to trek up the hill through Labbookelle Tea Estate . The scenic beauty is inexplicable. When we visited this place, the whole area was engulfed in fog , it was drizzling and cool breeze was soothing . ( As the muddy road was drenched with rain, we were told that it would not be possible to go there by our guide. But we insisted to be taken there and because of Hanuman’s grace, two auto drivers agreed to take us and we could visit the place.) Presently , there is only a small shiva linga under a tree. Sri.Kanakaraj, a disciple of Chinmaya Mission who accompanied us informed that on a clear day, we can view both Ramboda and Nuwara Eliya. presuming SHE would like the hill station and the natural beauty of his kingdom and succumb to his wish. The village is named as Kondakalai because while Ravana was forcibly taking Sitadevi to Ashoka vanam, Sitadevi’s hair got deranged. He also informed that the food given by RAvana to Sitadevi was thrown away by HER which fell scattered in the surrounding forests. The remains became fossils known as “SITA GOOLI” have been certified by American researchers as vitaminised rice balls dating few thousands of years . These balls are considered as symbol of auspiciousness. We were fortunate to get them to be placed in our altar. Near Manikatuther, there is a temple for Sriman Narayana seated on Garuda with Sridevi and Bhudevi. 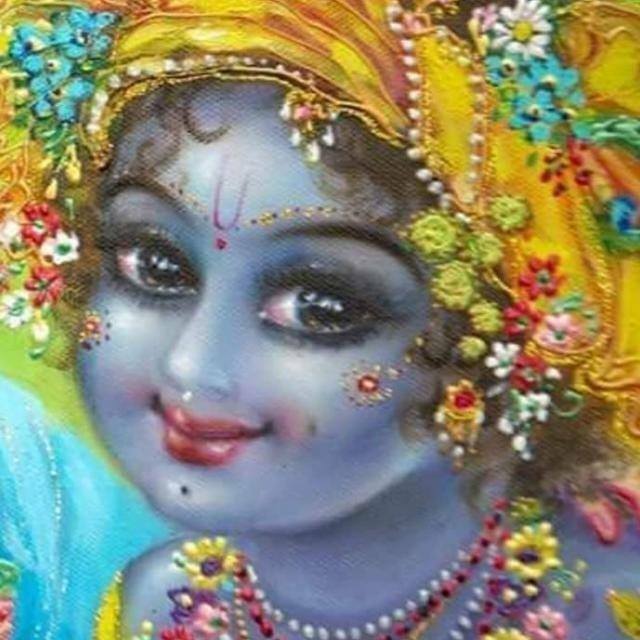 Mahavishnu is bluish in complexion . But the locals address this temple as “Rama temple”. During Margazhi,(Dec-Jan), early morning Pooja is performed and bhajans are conducted in the nights during the whole month. Few rare beautiful pics from Ramayanam are hung on the walls inside the temple. When Hanumanji entered Ashoka Vanam (presently known as Hakgala Botanical Gardens in Nuwara Eliya), the flowers blossomed , birds chirped and the weather was very pleasant. Some flowers dropped on Hanuman’s body which added to his beauty. Hanuman jumped from one tree to the other in search of Sitadevi. Finally, he found a sobbing distressed lady glowing with effulgence under a tree and looking at her appearance, the colour of her sari and the jewels which were hanging from the tree, Hanuman guessed that it was Sitadevi. His joy knew no bounds. He was contemplating as to how he has to pick up a conversation with her. Meanwhile, RAvana arrived and started persuading Sitadevi. Sitadevi who is the mother of Universe advised him to restore HER back to Lord Rama and get saved mentioning Sri Rama’s nature to forgive anyone who came for asylum even if it had committed the gravest sin. When Sitadevi rebuked him by recalling his cowardly act of stealing HER in Srirama’s absence , he became so wild that he wanted to harm her but was stopped by his wife Daanyamaalini. The egoistic Ravana left after warning her that she would be killed and served as breakfast at the end of two months in case she doesn’t concede to his request. The rakshasis who were threatening her were chastised by Trijata-Vibhishana’s daughter who disclosed the dream she had. Trijata revealed her dream in which she saw victorious Lord Rama seated with Sitadevi wearing white silk clothes on Pushpaka vimanam ,Ravana’s death, anhilation of rakshasa clan, Vibhishana’s coronation and advised the rakshasis to stop torturing Sitadevi as SHE alone could protect them from SRirama’s wrath. The rakshasis stopped harassing and slept. Sitadevi who was totally devastated, decided to end her life by hanging HERSELF from Simshuka tree with her hair. 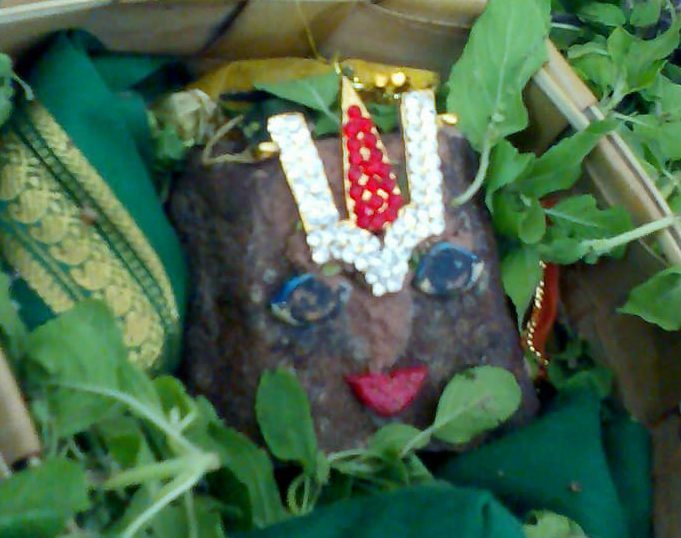 Hanumanji who was sitting on the Simshuka tree became worried at HER approach. To save HER from this disaster, Hanuman softly sang Srirama’s story starting from HIS appearance,wedding, banishment , Ravana’s foul play in kidnapping Sitadevi, Jatayu’s death, Sugreeva’s friendship, their search operation etc. Hanuman presented himself as Rama’s messenger and sugreeva’s minister. He described in detail about Srirama and enquired about devi’s identity. When Sitadevi got convinced that he was Rama’s messenger, Hanuman presented the holy ring given by Srirama to her and pacified HER that SRirama would kill Ravana ,resuce HER and return to Ayodhya to rule the world. Just as our acharyar gives us the holy name (Tirumantram) to us during Samasrayanam, Hanuman gave tthe holy ring with SRirama’s name engraved on it. Looking at the ring, Sitadevi wept uncontrollably remembering their separation and suffering . Thus , the entire Ramayana was sung by Hanuman. This place is known famously known as “SITA ELIYA-SITA AMMAN TEMPLE” located about 4 kms from Nuwara Eliya on a lower altitude. Nuwara Eliya,also known as “Little England” located in the Central highlands of Srilanka is a hill station and one of the coldest regions in Srilanka . The thought that Sitadevi sitting under the tree in the cool Ashoka gardens without any protection against the harsh weather conditions made us feel depressed. Hanuman convinced Sitadevi that Srirama would come at the earliest and rescue HER. Unable to tolerate Sitadevi’s distress, Hanumanji offered to carry HER on his shoulders and unite HER with Srirama. He expanded his form to convince about his capabilities. So, we can see two sets of footprints in Sita Amman temple-one small and the other one huge . Hanuman pacified Jaganmatha assuring HER of Srirama’s arrival to resue HER and consoled her thus saving HER life. When Hanuman requested Sitadevi to give some token of identification to present to Srirama, Sitadevi handed over the “choodamani ” and shared few incidents with Hanuman including Kakasuran’s episode , about how the Lord applied thilak so that HE would believe Hanuman as these incidents happened in solitude. After taking Sitadevi’s blessings, Hanuman decided to meet Ravana and convey Rama’s message. So, he uprooted the trees in Ashoka vanam . He defeated the rakshasas who came to fight, destroyed one-fourth of Ravana’s army including 80000 kinnaras, five army chiefs, Ravana’s son-Akshakumara and finally voluntarily got bound by Indrajit’s brahmastra as vayuputra wanted an audience with Ravana. All these incidents took place at “” Hakgala Botanical Gardens”. Hanuman was taken to RAvana’s assembly in Sigiriya Fort. Hanuman introduced himself as Sugreeva’s minister and Srirama’s messenger , informed the killing of Vali who had humbled RAvana earlier , advised Ravana to return Sitadevi and save his clan from Srirama’s wrath which infuriated Ravana . Ravana ordered Hanuman to be killed but was intercepted by Vibhishana who said that a messenger should not be killed but could be punished. Ravana ordered that Hanuman’s tail be burnt and taken along all the streets . Hanuman’s tail was wound with cloth dipped in oil and fire was lit. The jubilant rakshasas unaware of Hanuman’s prowess abused him and insulted him by throwing stones and took him through all the places. Hanuman unmindful of the pain thought that it was a good opportunity so that he can once again see Lanka in the day light. Few rakshasis rushed to Sitadevi to inform about the happenings. Sitadevi experienced intolerable grief for the punishment. She washed her hands in the nearby stream , lit a pyre and prayed to Agnideva to protect Hanuman by proclaiming that if she was chaste and if it is true that sirama would resuce her, Agni should not harm Hanuman. Hanuman realised that though his tail was burning, he didn’t feel any burning sensation or pain. He realised that it was because of Sitadevi’s compassion , the fire didn’t harm him. Hanuman wanted to express his gratitude to firegod by offering the tall mansions to agni. Hanuman freed himself from rakshasas’ clutches and jumping from one building to the other including RAvana’s palace and assembly , he lit fire in all the places. AS the golden Lankapura was on a hill where heavy winds blow, the fire spread immediately . The whole of Lanka was in flames. Hanuman burnt the whole Lanka including Ravana’s airports at WEragantota , Ussangoda (the southern tip of Lanka). Hanuman cooled his burning tail in the waters near Ussangoda near Hambantota- a sea coast about 83 kms from Galle.The sand here is red in colour. Usually red sand would be wet whereas here it is as hard as rock. No vegetation grows here. This is a protected site. It is advisable to visit this place in daytime . Hanuman returned to the vanara camp and shared with them Sitadevi’s welfare. He informed them in detail about his entire journey. They started the return journey to Kishkinda to inform the good news to SRiram, Enroute stopped for a while at Madhuban near Hampi to satisfy their hunger. While all the vanaras were satiating their hunger by drinking honey and eating fruits, Our Hanuman was relising the nectarian names of Lord Rama which was his lifeline. Hanuman and other vanaras headed by Angadha returned to Maalyavan parvath and informed about Sitadevi’s welfare and presented the choodamani to Srirama. A beautiful temple for the Lordships at the place where this incident took place can be seen in Hampi. Srirama praised Hanuman and embraced him for completing the mission thus emphasising that HE COULD BE ATTAINED ONLY WITH HANUMAN’S GRACE. Our poorvacharyas say that when Hanuman submittd to Srirama without Sitadevi, his tail got burnt but when he got Sitadevi’s blessings, he was blessed with Lord Rama’s embrace . This emphasizes Thayar’s intervention as PUrushakaaram in our Srivaishnava sampradayam. Thus ends the wonderful prose Sundarakandam. Next postThe EGO is not getting rid of me Gurudeva ! Please help ! !